For my friends living in the Seattle/Tacoma area, next week Thursday, August 25th is FREE car wash day at Brown Bear Car Wash. They will be open all day from 8 am – 8 pm to wash your vehicle. 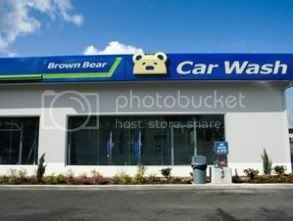 No coupon required, just visit any Brown Bear tunnel wash location and you will get the "Bear Essentials" car wash for FREE. The free car wash day is their way of showing appreciation to customers for 54 years in business. You can use their store locator to find the Brown Bear location closest to you. Since 1957 Brown Bear Car Wash has been Seattle's premier car wash company using the latest car wash technology to produce the cleanest vehicles on the road. Brown Bear Car Wash will be having their annual FREE Car Wash day on Thursday, August 25th 2011. The FREE car wash is available at all tunnel locations. There is no coupon necessary.